ספרו הראשון של זאב רונן מרכז את סט הכלים שכל מנכ"ל ומנכ"לית צריכים להכיר, ומציג אותם בצורה תמציתית, ברורה ועקבית - כזו שתוציא את הקורא עם ידע מקיף ומשמעותי שיסייע לו בעבודתו כמנהל. הספר כתוב באנגלית ונקרא: Manage! Best Value Practices for Effective Management. בספרי הראשון Manage ריכזתי את סט הכלים שמניסיוני כל מנכ"ל ומנכ"לית צריכים להכיר, וניסיתי להציג אותם בצורה תמציתית, ברורה ועקבית – כזו שתוציא את הקורא עם ידע מקיף ומשמעותי שיסייע לו בעבודתו כמנהל. הספר יהיה שימושי מאד לכל המנהלים והמנהלות באשר הם ובפרט למנהלים חדשים. הספר מתמקד בניהול אנשים ומסביר איך לשפר את התוצאות העסקיות (ואת העבודה בכללותה) ע"י רתימה וחיבור של העובדים למטרות החברה. הוא משלב תיאוריות ניהוליות עם דוגמאות מעשיות רבות שפגשתי במהלך 20 שנותיי כמנכ"ל מפעלים וחברות ו-10 שנותיי כיועץ למנהלים ומוביל תהליכי שיפור בעולם התעשייה והעסקים. תוך התמקדות בצרכי המנהלים ובאתגרים והקשיים הנפוצים ביותר שעודמים בפניהם, כתבתי ספר ממוקד וקצר שיסייע לך בבחירת דרכך הניהולית והתמודדות עם אתגרים שונים בעבודה, ואני משוכנע שיהיה לך לתועלת רבה. הספר מבוסס על מאמרים שפרסמתי בבלוג הפופולרי שלי ואשר זכו לעניין רב ותגובות מצד הקוראים. עלות הספר היא 75 ש"ח בלבד. 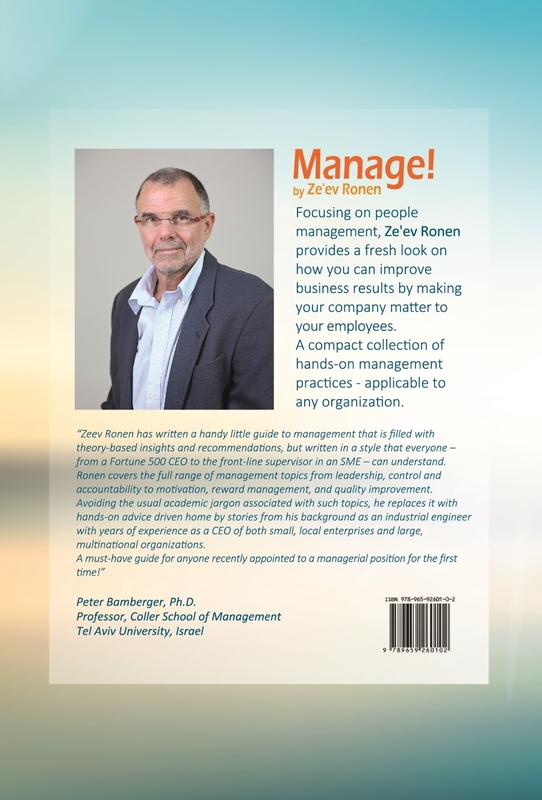 Zeev Ronen has written a handy little guide to management that is filled with theory-based insights and recommendations, but written in a style that everyone – from a Fortune 500 CEO to the front-line supervisor in an SME – can understand. 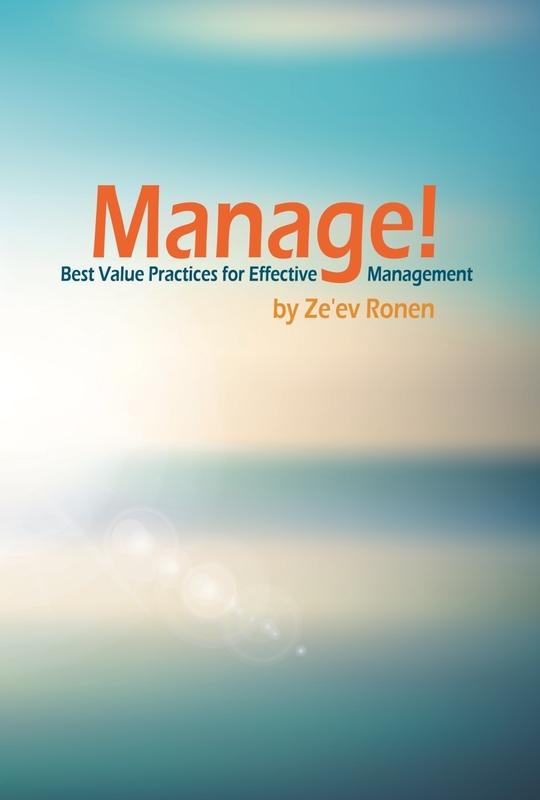 Ronen covers the full range of management topics from leadership, control and accountability to motivation, reward management, and quality improvement. Avoiding the usual academic jargon associated with such topics, he replaces it with hands-on advice driven home by stories from his background as an industrial engineer with years of experience as a CEO of both small, local enterprises and large, multinational organizations. A must-have guide for anyone recently appointed to a managerial position for the first time! הספר הוא תמציתי, מעשי, ונוגע בנקודות התורפה של מנהלים שעלולות לחבל בצמיחה של הארגון ומימוש הפוטנציאל העסקי שלו. מצויין למנכ"לים בתחילת דרכם שמעוניינים להיעזר בניסיונו של מומחה כדי למנוע טעויות. מומלץ גם למנהלים מנוסים שמוכנים להתבונן בסגנון הניהול שלהם בעין בוחנת. לאחרונה קראתי את ספרו של זאב רונן MANAGE. זו אסופה יוצאת מהכלל של מאמרים וכלי עבודה למנהל, שכמוה לא ראיתי מזמן והינו ספר חובה על שולחנו של כל מנהל זוטר או בכיר (גם הפרקים השונים בספר מהווים כלי חשיבה עבור כל מנהל בכל רמה). הספר כתוב בשפה פשוטה שמתאימה לכל דרגי הניהול, טוב יעשו מנכ"לים של חברות אם יתנו את הספר כמתנת יום הולדת או מתנה לחג למנהלי הארגון. Ze'ev Ronen has managed to provide significant insights in this short guide on successful management practices. This is not only a useful book but a fun and quick reminder that measurable common sense, decent treatment of colleagues, employees, and your boss or chairman are central productivity and motivational tools. Ze'ev Ronen reveals what we all intuitively know but don't always practice. These insights are worth following no matter where you work and what your business is! Your book is very useful, easy to grasp and a good tool. Very good. Congrats – many will benefit from it. I just read this handy book and loved it. As a manager, I found Ronen's insights to be very valuable. I think it could also be a good reference for beginners: University graduates starting their first job, will get a more practical view of how things work and what actually matters. The purpose of this book is to provide a fresh look on how you can improve business results by making your company matter to your employees. The first part, which is presented here, presents the author's choice of 12 leadership principles. The second part discusses the relationship between the CEO and the management team as well as the relationship between the CEO and the board of directors. The third part describes with many examples how to lead the organization by engaging the employees. In the last part you will find a selection of vital tools for performance measurement, root cause analysis and problem solving. Looking back on my twenty years as chief executive officer (CEO) and consolidating the wisdom and experience of dozens of CEOs and executives with whom I have worked as a business consultant, here are my 12 "golden" rules for effective management. For simplicity, I refer here to the CEO-Level. However, the same principles apply to any management level. Note: Any reference to gender in this book is incidental; the statements apply to male and female managers interchangeably unless specifically mentioned otherwise. other internal power holders, who might challenge and/or resist her intentions . I have met quite a few managers who avoid managing their subordinates. In one extreme case, the CEO (who was also the owner) of a company struggling for survival preferred to hide in his office and anxiously watch the deterioration of his firm into insolvency. Even though the reasons for the downhill slide were clear, he was afraid to confront his subordinate managers, mainly because they were members of his family. Extreme as it may sound, cases of CEOs who are afraid to confront the centers of power under them are quite prevalent. Leadership is by far the most important trait of successful management and is relevant for all organizations. The importance of the following principles may change from one organization to another. But all of them are indispensable for sustainable profitability and growth. the growth of a company will be coincidental and short-lived. The vision statement must be revisited every few years in order to deal with changes in the business environment. Involving relevant thinkers from all parts of the organization (and sometimes even from outside) in such vision reviews is recommended. These are derivatives of the vision statement. Without them the evolution of the company will be somewhat unpredictable. Here too, responsiveness to the market dynamics is crucial, and teamwork is most advisable. from the company. These are harsh words, but reflect reality. When the CEO behaves unfairly and uses double standards toward employees, disloyalty and embitterment ensue at all levels of the organization. Incidents of unfairness travel fast by word of mouth. The CEO should make every effort to convince his employees that his actions are motivated by reason; that he cares for the well-being of the company; and that he is free from personal bias. All managers and employees, down to the last one, watch what the CEO does and not merely what he says. A manager whose actions contradict his words will not be able to establish the organizational culture based on his stated principles and values. For example, if a CEO never shows up at work before 10:00 am and is usually late for meetings, his demands for efficient meetings which always start on time will not be taken seriously. The same goes for values such as honesty, truthfulness and loyalty. The more employees and managers are exposed to information about company goals and its performance, the more possible it is to harness their sense of partnership for the company's success. Transparency adds power to an organization. Hiding information creates a break between the employees and the company; it diminishes their identification with the company, its goals and its pursuit of profit. Transparency does not mean that everyone knows everything. However, I strongly believe that all sales people should be exposed to the sales targets and the sales results on a regular basis. Similarly, it is appropriate to reveal production targets and results to all production employees. By sharing information with employees, we signal our trust in them and invite them to feel part of the effort. business results, but also understand its importance as a motivator for employees to identify with the organization and contribute to its success. Employees and their managers are a valuable source of information about weaknesses and process improvement. A manager who listens to employees carefully, with personal attention, encourages innovation and boosts employee motivation at all levels. Attentiveness, fairness and sense of comradery should not relax the demand for discipline. All of us have been testing boundaries since we were children and we will continue to do so for the rest of our lives. The key to repetitive success is disciplined implementation of effective business processes. Consider the following: An employee smokes a cigarette at his workstation while operating a lathe. His manager asks him to put out the cigarette and reminds him that smoking is allowed only in designated areas. The following day, at the end of the work shift, after changing out of his work uniform, the same employee lights a cigarette outdoors and walks into the workshop smoking near the manager. How should the manager respond? If this manager or the CEO does not define clear cut boundaries and enforces discipline, he will not be able to lead the company to its goals. objectives accordingly. The annual objectives of the current year should be monitored on a monthly basis. See more in Improving company performance and endurance using monthly targets. responsibility with adequate authority to each of them. Her task is then to monitor the senior managers' progress according to their respective work plan and help them resolve conflicts and contingencies as they arise. See more in The CEO and the management– delegating responsibility. Finally, after the work plan has been defined, objectives set and responsibilities delegated, the CEO must implement a persistent monitoring routine with quantitative measurements. Resisting the temptation to intervene with the work of his subordinate managers, the CEO should examine their results in light of their targets at least once a month. Whenever a delay or a deviation from the work plan is identified, the relevant manager should submit a corrective action plan for review by the CEO and the other managers at a management meeting. מלא/י בטופס את פרטיך והספר ישלח אליך בדואר. הטופס מאובטח ופרטייך מוצפנים. פרטי כרטיס האשראי ו/או חשבון ה-PayPal שלך לא עוברים דרך האתר ולא נשמרים בו. אנא קרא/י את תנאי השימוש באתר בקישור זה וסמן/י את התיבה לאות אישור התנאים. הגלישה והרכישה בחנות נעשית על גבי חיבור מאובטח והפרטים שלך מוצפנים. פרטי כרטיס האשראי וההתחברות ל-PayPal לא עוברים דרך האתר ולא נשמרים בו. באילו דרכים ניתן לשלם בחנות? בשלב זה, ניתן לשלם רק באמצעות PayPal (גם אם אין לכם חשבון רשום ב-PayPal). בשבועות הקרובים נוסיף גם אפשרות לתשלום מאובטח באמצעות כרטיס אשראי. האם טופס התשלום בחנות מאובטח? הטופס, כמו האתר כולו, מאובטח באמצעות תעודת SSL של חברת האבטחה המובילה בעולם - Comodo. המידע האישי שלך וכל מידע מזהה אחר מוצפן ומאובטח לחלוטין. האם אפשר לשלם גם אם אין לי חשבון ב-PayPal? באתר של PayPal תוכלו לשלם גם אם אין לכם חשבון PayPal, באמצעות פרטי כרטיס האשראי שלכם. התשלום הוא מאובטח לחלוטין ומתבצע דרך אתר PayPal. כיצד אקבל חשבונית עבור הרכישה בחנות? מס' ימים לאחר אישור התשלום תישלח אליך בדוא"ל חשבונית מס-קבלה חתומה דיגיטלית שתופק באופן ידני. במידה שהחשבונית לא תישלח אליך תוכל/י לפנות אלי בצורה ישירה כדי להסדיר את הנושא במהירות, בדוא"ל zeev.ronen@business-excellence.co.il או בטלפון 0524-767-531. האם אתם שומרים את פרטי כרטיס האשראי שלי? פרטי כרטיס האשראי שלך ו/או פרטי חשבון ה-PayPal שלך כלל אינם עוברים דרך האתר שלנו ואין לנו כל גישה אליהם. בעת ביצוע התשלום האתר יפנה אותך ל-Paypal לצורך ביצוע ההתחברות והתשלום, ורק ל-PayPal תהיה גישה לפרטים שלך. אנו נשמור בצורה מאובטחת רק את פרטי הקשר שלך (כגון שם, כתובת מגורים וכתובת דוא"ל) לצורך שליחת החשבונית ויצירת קשר במידת הצורך. אנו מספקים שירותי שיפור והתייעלות לחברות במגוון תחומים - לחצו על כל כותרת לפרטים נוספים.